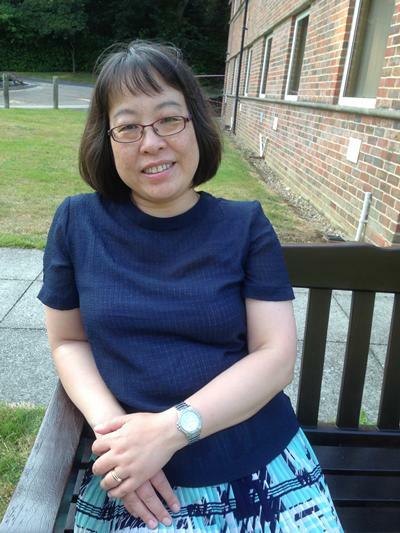 Professor Liudi Jiang is Professor of Materials and Electromechanical Systems within Engineering and Physical Sciences at the University of Southampton. 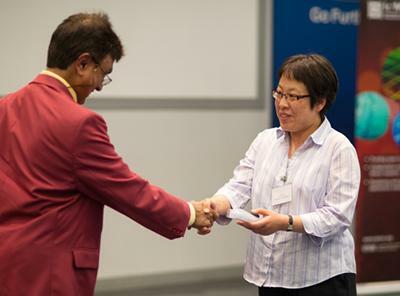 Liudi Jiang obtained BEng in Microelectronics, MSc in Physics. She received her Ph.D. in advanced materials from the University of Dundee in 2002. This was followed by her postdoctoral fellowship at the University of Edinburgh on multidisciplinary research in developing novel materials, processes and electromechanical sensors for a range of applications etc. She was appointed a RCUK Academic Fellow (Roberts Fellow) in 2006 at the University of Southampton, Lecturer in 2008, Associate Professor in 2013 and then Professor in 2015. She is a Chartered Physicist. Liudi currently leads a research group of 7 PhD students and 3 postdoctoral fellows with research projects spanning multidisciplinary areas of electromechanical sensors/actuators, functional materials and intelligent systems for many applications including e.g. biomedical, smart body interface, intelligent sensor/actuator systems, gait biomechanics, micro/nanoelectromechanical systems, and energy harvesting. She is currently the Director of Research for the Engineering Sciences Academic Unit. Load sensing and monitoring at the body-support interface is important for physical rehabilitation and can potentially be used to prevent skin ulcers and/or soft tissue breakdowns, which is affecting quality of lives of many patients. 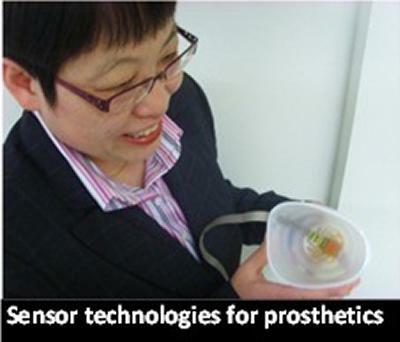 We are developing interfacial sensor systems underpinned by a novel sensor technology (supported by tissue viability studies) to provide practical solutions which bring benefit to a range of patients such as prosthetic and orthotic patients, diabetes, wheel chair users, and elderly people. For more information visit the TRIPS sensor system website. Transistor based RAM and flash memories are facing intrinsic limitation caused by further down-scaling. 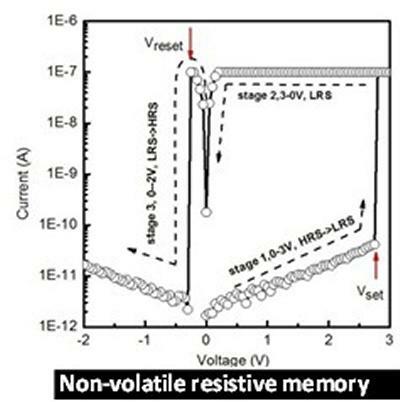 We are working on non-volatile resistive memories based on novel advanced material process research, which present one of the highest ON/OFF switching ratios reported and thus strong potential for future memory applications. Our dielectric materials also present advantageous electrical and mechanical properties which could be used as advanced interlayer materials in metal interconnect structures to reduce capacitive power losses and RC delays in integrated circuit. Switching contact surface with high electrical and mechanical performance is the key towards MEMS switches with high reliability and long life time, which remains a bottle-neck for the multi-billion ($) market worth MEMS switches/relay industry An unique CNT/metal composite material and processes have been developed for this application which has demonstrated orders of magnitude improvement in terms of cycles to failure tests under typical MEMS reply application conditions. Jiang, L., & Cheung, R. (2009). A Review of silicon carbide development in MEMS applications. International Journal of Nanomanufacturing, 2(3/4), 225-240. Jiang, L., & Spearing, S. M. (2007). A reassessment of materials issues in microelectromechanical systems (MEMS). Journal of the Indian Institute of Science, 87(3), 363-385. Plank, N., Jiang, L., Gundlach, A. M., & Cheung, R. (2003). The electrical characteristics of 4H-SiC Schottky diodes after ICP etching. Journal of Electronic Materials, 32, 964. Valero, M., Hale, N., Tang, J., & Jiang, L. (Accepted/In press). A comprehensive mechanotransduction model for tactile feedback based on multi-axial stresses at the fingertip-contact interface. Paper presented at IEEE World Haptics 2017, Fürstenfeldbruck, Germany. Tang, J., Hale, N., Mcgrath, M., Jiang, L., Bader, D., Laszczak, P., ... Zahedi, S. (Accepted/In press). Assessing the effect of walking speed on the residuum/socket interface biomechanics. Abstract from ISPO 16th World Congress, South Africa. Tang, J., Hale, N., Mcgrath, M., Jiang, L., Bader, D., Laszczak, P., ... Zahedi, S. (Accepted/In press). Method to assess biomechanical coupling at trans-femoral residuum/socket interface. Abstract from ISPO 16th World Congress, South Africa. Hale, N., Valero, M., Tang, J., Mcgrath, M., Laszczak, P., Gao, J., ... Jiang, L. (Accepted/In press). A preliminary study on characterisation of finger interface kinetics using a pressure and shear sensor system. 2016 Trent International Prosthetic Symposium, United Kingdom. Tang, J., Mcgrath, M., Hale, N., Jiang, L., Bader, D., Moser, D., ... Bradbury, R. (Accepted/In press). Assessment of socket interface kinematics and kinetics based on a trans-femoral amputee case study. The 2016 Annual Scientific Meeting of ISPO UK Member Society, United Kingdom. Mcgrath, M., Tang, J., Hale, N., Jiang, L., Bader, D., Laszczak, P., ... Zahedi, S. (Accepted/In press). Clinical evaluation of a measurement system for loading at the lower limb stump/socket interface. The 2016 Annual Scientific Meeting of ISPO UK Member Society, United Kingdom. Gao, J., Laszczak, P., Mcgrath, M., Tang, J., Jiang, L., Bader, D., ... Bradbury, R. (Accepted/In press). A case study quantifying stump/socket interface stresses of lower-limb amputees. Poster session presented at The 2016 Annual Scientific Meeting of ISPO UK Member Society, United Kingdom. Lewis, A. P., Down, M., McBride, J. W., Jiang, L., & Spearing, S. M. (2015). Carbon nanotube (CNT) composite surfaces for electrical contact interfaces. Poster session presented at IeMRC 9th Annual Conference, United Kingdom. Laszczak, P., Jiang, L., Moser, D., Mcgrath, M., Gao, J., Tang, J., ... Zahedi, S. (Accepted/In press). Effects of clinical interventions and everyday activities on the dynamic loading at the lower limb stump/socket interface. The 2016 Annual Scientific Meeting of ISPO UK Member Society, United Kingdom. Tang, J., Jiang, L., Moser, D., & Zahedi, S. (2015). The effect of integrated microprocessor controlled knee-foot for inclined walking - a preliminary study on LiNX. Poster session presented at 2015 American Orthotic Prosthetic Association National Assembly, United States. Tang, J., Jiang, L., Bader, D., Laszczak, P., Gao, J., Mcgrath, M., ... Bradbury, R. (Accepted/In press). Use of gait lab 3D motion capture for dynamic assessment of amputee socket interface biomechanics with validation using TRIPS sensors systems – a case study. The 2015 Annual Scientific Meeting of ISPO UK Member Society, United Kingdom. Lewis, A. P., Jiang, L., Spearing, S. M., Down, M., Chianrabutra, C., McBride, J. W., ... Liu, H. (2014). 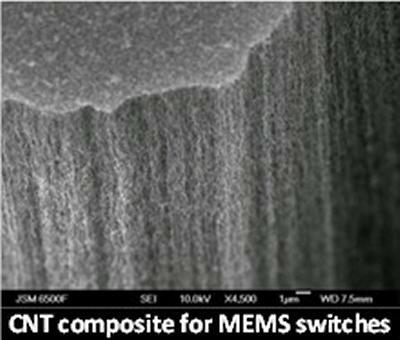 Carbon nanotube composite surfaces for electrical contacts of MEMS switches. Micro Nano MEMS 2014, United Kingdom. Tang, J., Jiang, L., Bader, D., Moser, D., McCarthy, J., Bradbury, R., & Zahedi, S. (Accepted/In press). Influence of stump/socket relative movement on gait analysis for above knee amputees – a case study. The 2014 Annual Scientific Meeting of ISPO UK Member Society, United Kingdom. Liu, H., Lewis, A. P., Pu, S-H., Jiang, L., & McBride, J. W. (2014). Influence of the height of carbon nanotubes on hot switching of Au/Cr-Au/MWCNT contact pairs. Paper presented at 16th Electronics Packaging Technology Conference, Singapore. Liu, H., Lewis, A. P., Down, M., Jiang, L., & McBride, J. W. (2014). Investigation of the benefit of MWCNT forests for electrical contacts. 27th International Microprocesses and Nanotechnology Conference (MNC 2014), Japan. Lewis, A., Down, M., Chianrabutra, C., Jiang, L., Spearing, S. M., & McBride, J. W. (2014). Lifetime testing of a developmental MEMS switch incorporating Au/MWCNT composite contacts. Paper presented at The 27th International Conference on Electrical Contacts, Germany. Lewis, A., Chianrabutra, C., Down, M., McBride, J. W., Jiang, L., & Spearing, S. M. (2013). Carbon nanotube composite surfaces for electrical contact interfaces. Poster session presented at R2i2 Electronics Conference, United Kingdom. Chianrabutra, C., Jiang, L., Lewis, A., & McBride, J. W. (2013). Evaluating the influence of current on the wear processes of Au/Cr-Au/MWCNT switching surfaces. 344-349. Paper presented at 59th IEEE Holm Conference on Electrical Contacts, United States. Down, M., Chianrabutra, C., Lewis, A. P., Pu, S-H., Jiang, L., Spearing, S. M., & McBride, J. W. (2013). The application of gold coated carbon-nanotube surfaces as electrical contact surfaces. IeMRC 8th Annual Conference, . Lewis, A., Down, M. P., Spearing, S. M., Jiang, L., Chianrabutra, C., & McBride, J. W. (2013). The effect on switching lifetime of chromium adhesion layers in gold-coated electrical contacts under cold and hot switching conditions. Paper presented at 59th IEEE Holm Conference on Electrical Contacts, United States. Lewis, A., McBride, J. W., Jiang, L., Spearing, S. M., Chianrabutra, C., & Down, M. (2012). Carbon nanotube composite surfaces for electrical contact interfaces. Poster session presented at IeMRC 7th Annual Conference, United Kingdom. McBride, J. W., Jiang, L., & Chianrabutra, C. (2012). Fine transfer in electronic switching contacts using gold coated carbon-nanotubes. Paper presented at 26th International Conference on Electrical Contacts (ICEC), China. Ren, M., Ou, J-Y., Jia, B., Plum, E., Zhang, J., Jiang, L., ... Zheludev, N. I. (2011). Functional photonic metamaterials. IEEE Photonics 2011, United States. Ou, J-Y., Plum, E., Jiang, L., & Zheludev, N. I. (2011). Nano-electromechanical switchable photonic metamaterials. Paper presented at Metamaterials 2011, Spain. Ou, J-Y., Plum, E., Jiang, L., & Zheludev, N. I. (2011). Reconfigurable photonic metamaterials. Paper presented at CLEO/QELS 2011: Lasers and Electro-Optics and Quantum Electronics and Laser Science Conference, United States. Khu, K., Jiang, L., & Markvart, T. (2010). Thermodynamic modeling of micro heat engines for power generation. Poster session presented at PowerMEMS 2010 - The 10th International Workshop on Micro and Nanotechnology for Power Generation and Energy Conversion Applications, Belgium. Jiang, L., Pandraud, G., French, P. J., Spearing, S. M., & Kraft, M. (2006). Nanoprecision alignment for wafer bonding. 101-104. Poster session presented at 17th workshop on Micromachining, Micromechanics and Microsystems, United Kingdom. Enderling, S., Jiang, L., Ross, A. W. S., Bond, S., Hedley, J., Harris, A. J., ... Walton, A. J. (2004). MEMS resonator tuning using focused ion beam platinum deposition. 421. Paper presented at NSTI Nanotechnology Conference and Trade Show (Nanotech 2004), .